How did the Seattle Seahawks, “the best collection of leftovers this side of the day after Thanksgiving” according to sports writer John Boyle and the “guys who have kind of been thrown aside by other teams, guys with chips on the shoulders” pointed out fondly by former Seahawk wide receiver Brandon Stokely punch the ticket to the 2014 Super Bowl? One reason is the Seahawk’s ebullient, 62-year-old-going-on-32 coach Pete Carroll’s mandate to his players to “follow the ball” — a strategy that focuses everyone’s eyes on what is actually happening on the ground regardless of whatever pre-planned play may have been called. This strategy is not about the ball, it is about seeing the ball. The result is the Seahawks often see what other teams miss. Unbeknownst to those of us who are obsessed with our big brains, our senses, dominated by our eyes, provide our only direct contact with the world outside our own heads. Despite the misconceived yet widespread belief that those systems are subjective and thus unreliable, they actually evolved to provide our sole source of accurate information about what goes on around us. Everything else is hearsay. In fact, our sensory systems cleverly bypass our brain’s lengthy, often inapplicable, conscious contemplations and instead, they provide the information that expedites our immediate flight from danger – be it runaway cars or imminent sacks. Today, by relying on their eyes to update the playbook in their minds, Carroll’s players can track the pattern of the play as it occurs on the field before they are consciously aware of doing so. The focus-on-seeing mandate primes the Seahawks understanding of the situation at hand — where everyone and everything is and the obstacles and openings in front of their noses. It buys time and fosters their uncanny knack of getting the ball where they want it before their opponents actually know what’s happening. A second, less obvious reason for the Seahawk’s perceptual acumen is Carroll’s celebratory attitude and actions toward his band of rejects. He hugs them and loves them. And as he put it “we celebrate them being themselves, we cheerlead them into being themselves.” Carroll’s continual upbeat and supportive strategies promote the kind of confidence that helps his players trust their own judgment and see things for themselves which leads to their being at the right place at the right time. The result: they are typically on hand to back up cornerback Richard Sherman’s tipping and quarterback Russell Wilson’s flipping and the rest is history. 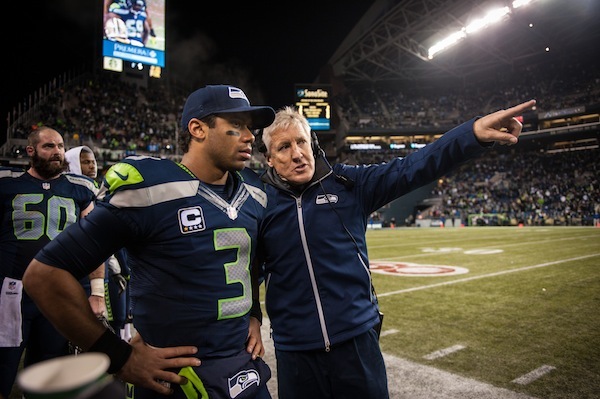 Russell Wilson listens as Pete Carroll gives instructions near the end of the game. Courtesy of Seattle Seahawks Organization. Seeing to the heart of the situation also put linebacker Malcolm Smith where he normally wouldn’t have been with thirty seconds left in the game and the 49ers on their own 15 yard line. Because Smith followed the ball, he was on the spot to play off Richard Sherman’s high-jump, left-handed tip and intercept 49er quarter back Colin Kaepernick’s 15 yard fade pass leaving linebacker Michael Crabtree empty handed in the end zone. With twenty-two seconds left, Smith’s knee hit the turf. Game over. Seattle Seahawks 23 – San Francisco 49ers 17. NFL analyst and Hall of Famer Michael Irvin claims the Seahawks’ story “is bigger than football. It’s an American story. When you take all that everybody else has discarded… and you pull the best out of each one and make it the best group,” you free players from preconceptions and playbooks to become the best they can be. But what Irvin doesn’t say is that those players also see the most that they can see. Viki McCabe, PhD, is the author of Coming to Our Senses: Perceiving Complexity to Avoid Catastrophes and visiting scholar at the Department of Psychology, University of California, Los Angeles.